Easy and elegant, these Prosciutto Wrapped Pears with Blue Cheese will be a show stopper at your next party. You know that we are big fans of easy appetizers on Garnish with Lemon, and entertaining doesn’t get much easier than these little bites of goodness. Salty, sweet and tangy, these Prosciutto Wrapped Pears with Blue Cheese are the perfect trifecta of an appetizer. The salty prosciutto, tangy blue cheese and sweet pear flavors pair perfectly together and the balsamic glaze is just the icing on the cake. What ingredients do I need to make Prosciutto Wrapped Pears? The ingredient list is short so for tastiest results, make certain you are using quality ingredients. 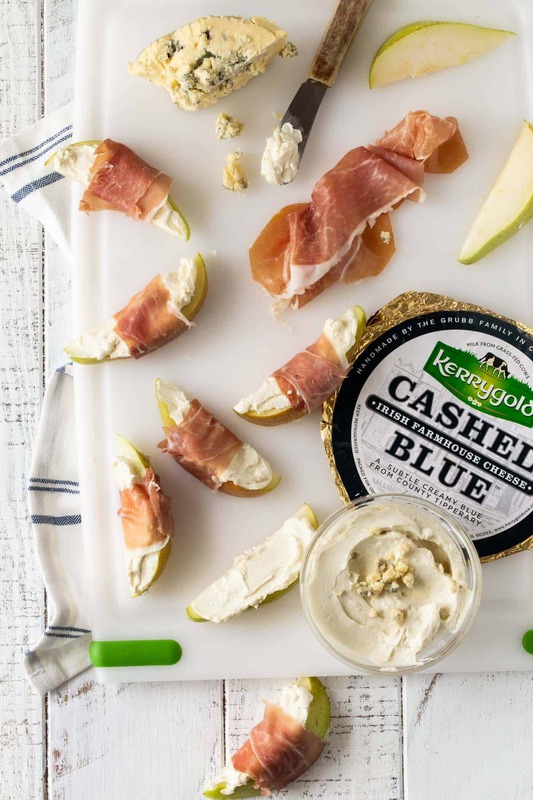 We used our favorite Kerrygold® Cashel Blue Farmhouse Cheese, mixed it with cream cheese and spread it on sweet Anjou pear slices. The prosciutto shines in this recipes, so this isn’t a time to skimp on the quality. Whatever kind you use, make sure that your slices aren’t paper thin for easy wrapping! How do I ripen pears? Pears can be tricky to find in the right stage of ripeness. If your pears are as hard as rocks (like mine were), a couple of days on the counter in a brown paper bag should do the trick. If you don’t have that kind of time, use a sweet apple in this recipe instead. How do I wrap pears in prosciutto? Even those these tasty morsels look super fancy, they come together in a snap. Simply cut a slice of prosciutto in half, place an end of the prosciutto on the center of the pear slice that has been slathered with the blue cheese mixture and wrap around. No need to secure with a toothpick, it will stay wrapped without it. Just because it looks gorgeous on a platter doesn’t mean it has to be time-consuming to make! 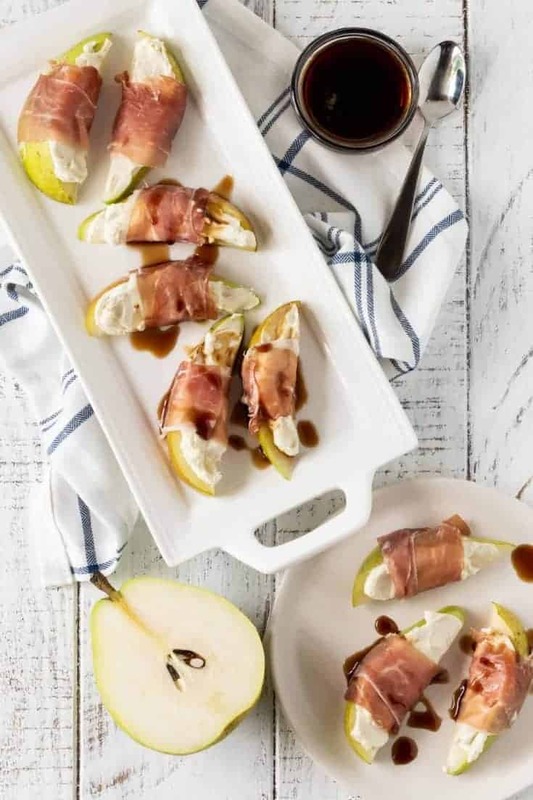 Simply plate your prosciutto wrapped pears, drizzle with a balsamic glaze and your work is done. 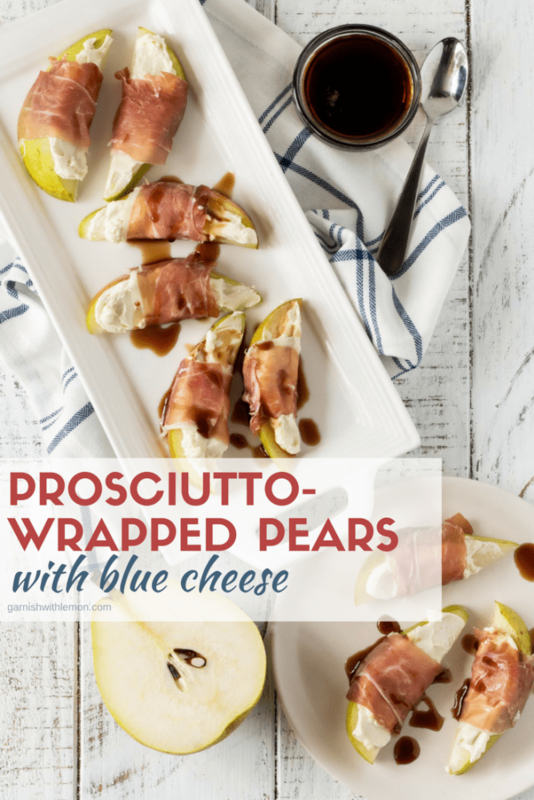 You can never go wrong when you serve an elegant appetizer packed with such great flavor like these Prosciutto Wrapped Pears with Blue Cheese. Need some more easy appetizers? Here are some of our favorites that come together in a flash! Cut each pear into 8 wedges squeeze a lemon wedge over top to prevent browning. In a small bowl combine softened cream cheese and blue cheese until smooth. Spread 2 teaspoons of cheese mixture on top of each pear slice and spiral wrap a slice of prosciutto around each one. Place on serving plate and drizzle with balsamic glaze before serving. Those look delicious! Sounds wonderful for an appetizer! Easy appetizers are the best! Looks amazing, ladies! Let’s party! Come and visit us! We would love to host you!